Lenovo Tab 2 A8 Specifications:-Â Lenovo has launched two budget Tablets at CES 2015 dubbed Lenovo Tab 2 A8and Tab 2 A10. Both tablets runs on Android operating system. Tab 2 A8 is 3G version of Â A7-30 and also support voice calling. Tablet comes up withÂ Dolby sound technology.Â Both the Lenovo Tab 2 A8 and Lenovo Tab 2 A10 tablets look identical and share some almost similar specifications. It isÂ available in Aqua Blue, Cotton Candy, Pearl White or Ebony Black. 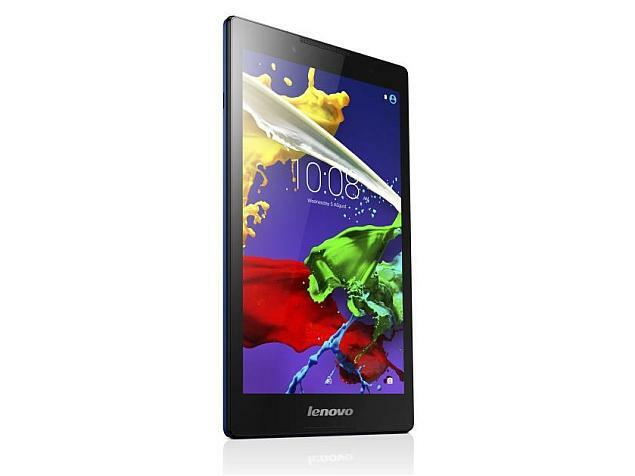 To have a detailed look then lets have a direct jump over toÂ Lenovo Tab 2 A8 specifications. Lenovo Tab 2 A8 features a 8-inch display with 1280 x 720Â pixel resolution andÂ pixel density of 189ppi. Device runs on android 5.0 Â kitkat and there is no word from company about its android update. Slate is powered byÂ is powered by a 1.3GHz quad-core MediaTek MT8161 processor underneath combined with Mali-T760 MP2Â and 1 GB RAM for fast processing. For storage the device is equipped with 8 GB internal storage which can be expended up to 32 GB via microSD card. Lenovo Tab 2 A8 boards 5-megapixel rear camera and 2-megapixel front camera. The device measures 125.00 x 210.00 x 8.90mm and weigh 360 grams Tab 2 A8 is slightly thick with thickness of Â 8.9 mm.It is backed by 4290 mAh and for connectivity there is wifi, Bluetooth,Â GPS, A-GPS,Â USB 2.0 and 3G. Lenovo Tab 2 A8 Â is priced at $ 129 and Rs. 8,100 in India and with LTE model available for Â another $50.